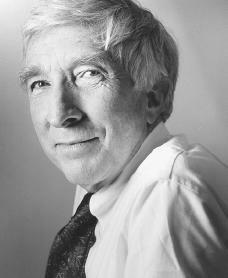 Author John Updike mirrored his America in poems, short stories, essays, and novels, especially the four-volume "Rabbit" series. John Hoyer Updike was born on March 18, 1932, in Shillington, Pennsylvania. His father, Wesley, was a high school mathematics teacher, the model for several sympathetic father figures in Updike's early works. Because Updike's mother, Linda Grace Hoyer Updike, had literary dreams of her own, books were a large part of the boy's early life. A sickly child, Updike turned to reading and art as an escape. In high school, he worked on the school newspaper and excelled in academics and upon graduation was admitted into Harvard University in Cambridge, Massachusetts. of becoming a cartoonist for the magazine. He majored in English at Harvard where he developed his skills as a graphic artist and cartoonist for the Lampoon, the college's humor magazine. In 1953, his junior year at Harvard, he married Mary Pennington, a Radcliffe art student. Upon graduation the following year, Updike and his bride went to London, England, where he had won a Knox fellowship (scholarship) for study at the Ruskin School of Drawing and Fine Art in Oxford, England. Updike returned to the United States in 1955 and took a job as a staff writer at the New Yorker at the invitation of famed editor E. B. White (1899–1985), achieving a lifelong goal. But after two years and many "Talk of the Town" columns, he left New York City for Ipswich, Massachusetts, to devote himself full time to his own writing. Updike began his remarkable career as a poet in 1958 by publishing his first volume, a collection of poems titled The Carpentered Hen. It is a book of light, amusing verse in the style of Ogden Nash (1902–1971) and Robert Service (1874–1958). The poetry possesses several styles shared by his fiction: careful attention to the sounds of words and of their meanings, the use of popular culture by identifying objects by familiar brand names, and the imitation of the popular press through advertising language. Updike's output of light verse diminished with the publication of each succeeding volume of poems. His poetry has been collected in several volumes, among them Telephone Poles and Other Poems (1963); Midpoint (1969), which is a personal look at the midpoint of his life; and Tossing and Turning (1977), which some critics consider his finest collection of verse. Although Updike's reputation rests on his complete body of work, he was first established as a major American writer upon the publication of his novel Rabbit Run (1960)—although at that date no one could have predicted the rich series of novels that would follow. It chronicled the life of Harry (Rabbit) Angstrom, creating as memorable an American character as any that appeared in the twentieth century. Harry Angstrom's life peaked in high school where he was admired as a superb basketball player. But by the age of twenty-six he is washed up in a dead-end job, demonstrating gadgets in a dime store, living a disappointed and constricted life. His natural reaction to this problem is to "run" (as would his namesake). And he runs, fleeing his wife and family as though the salvation of his soul depends upon it. The climax of Rabbit's search results in tragedy, but it is to the credit of Updike's skill that great sympathy for a dislikable character is brought forth from readers. The second novel in the series, Rabbit Redux (1971), takes up the story of Harry Angstrom ten years later at the age of thirty-six. Updike continues Rabbit's story against a background of current events. The novel begins on the day of the moon shot, when the first human walked on the moon. It is the late 1960s and the optimism of American technology is countered by the sour feelings towards race riots, antiwar protests, and the drug culture. His family is falling apart, mirroring the problems of the country at large. Rabbit finally overcomes his dismal situation and brings "outsiders" into his home, attempting to recreate his family. The next book in the series is Rabbit Is Rich (1981), which won the 1982 Pulitzer Prize. Rabbit is forty-six and finally successful, selling Japanese fuel-efficient cars during the time of the oil crisis in the 1970s. In this novel Rabbit's son Nelson's failure becomes the counterweight to Rabbit's success. Rabbit at Rest (1990) brings Rabbit into the 1980s to confront an even grimmer set of problems: acquired immune deficiency syndrome (AIDS; an incurable disease that attacks the immune system), cocaine addiction, and terrorism. Rabbit suffers a heart attack and is haunted by ghosts of his past. Death looms ever larger. In these four novels an insignificant life presses and insists itself upon our consciousness, and we realize that this life has become the story of our common American experience recorded over three decades. Updike wrote many other major novels, including The Centaur (1963), Couples (1965), A Month of Sundays (1975), The Witches of Eastwick (1984), Brazil (1993), and Bech at Bay (1998). Updike was also the author of several volumes of short stories, among them Pigeon Feathers (1962), The Music School (1966), Bech: A Book (1970), Museums and Women (1972), and Bech Is Back (1982). In 1999 Updike published More Matter: Essays and Criticism, a collection of occasional pieces, reviews, speeches, and some personal reflection. On February 27, 2000, his novel Gertrude and Claudius was published by Knopf. The book was based on William Shakespeare's (1564–1616) play Hamlet . Updike has been honored throughout his career: twice he received the National Book Critics Circle Award and the Pulitzer Prize. He also received the American Book Award and was elected to the American Academy of Arts and Letters. Updike has been one of the most productive American authors of his time, leading even his most dedicated fans to confess, as Sean French did in New Statesman and Society, "Updike can write faster than I can read." Bloom, Harold, ed. John Updike. Broomall, PA: Chelsea House, 1987. De Bellis, Jack. The John Updike Encyclopedia. Westport, CT: Greenwood Press, 2000. Schiff, James A. John Updike Revisited. New York: Twayne Publishers, 1998.